Combined Category D, C, B tested protector (to BS EN 61643-21) suitable for RF systems using coaxial cables at frequencies between DC and 2.7GHz and where DC power is present. 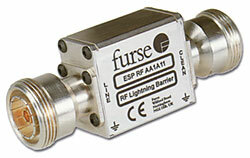 Suitable for RF systems with power up to 2.3kW. For use at boundaries up to LPZ 0A to protect against flashover (typically the service entrance location) through to LPZ 3 to protect sensitive electronic equipment. The Standard RF protector offers a cost effective protection solution for use on coaxial cables to protect RF transmitter and receiver systems, including electronics located at the antenna or dish. Typical examples include cell sites, military communications, satellite earth stations and pager systems. They can be used in applications where DC power is required to pass to the equipment. In a building, connect in series with the coaxial cable near where it enters or leaves the structure, or close to the equipment being protected. On a mast, connect in series with the coaxial cable near the antenna/dish being protected. Install in a radio communications room, an existing cabinet or a suitable enclosure.